The LJWC is proud to announce that New York Times bestselling author, Lisa Jackson, Dale Brown, and Christopher Reich will be joining the 2013 faculty as keynote speakers. Lisa’s is the queen of suspense. Her latest book, Ready To Die just hit stores in August and promises edge of your seat suspense from cover to cover. 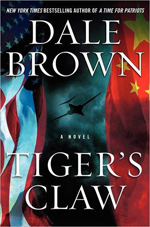 Dale is a classic techno-thriller writer and his new South China Sea thriller, Tiger’s Claw, might be his best novel yet. Christopher writes espionage thrillers. Rumor has it that his latest page turner will be hitting the shelves just in time for this year’s conference. If you’ve novel read a Christopher Reich novel, I highly recommend any of these. With literary agents, acquisitions editors, publicists, and tons of great creative faculty, this year’s conference promises to be amazing. For more information or to register, visits www.lajollawritersconference.com.